lt is a semiconductor device which acts as a true electronic switch. It can change alternating current into direct current and at the same time can control the amount of power fed to load. It is a P-N-P-N device. It can be considered as combination of two transistor. 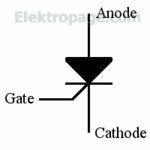 The difference between gate control of the current in a thyristor and the control of current in a transistor amplifier is that the thyristor gate electrode serves only as trigger to start the current. This electrode can not vary the anode current. In fact, after the forward current has started, reducing the gate voltage will not turn off conduction. The current can be turned off only when the anode voltage is reduced or become negative. The SCR is considered as a reverse blocking triode thyristor, meaning that it does not conduct with negative voltage at the anode, which can conduct for either polarity of applied voltage. The gate voltage is usually a train of pulses. Once the SCR is turned on, it stays on even after the gate pulse has been removed. The SCR holds the anode current until the anode voltage is low enough to reduce the current to 3 to 10 mA for about 50 µs for a mediurn power SCR. This minimum value of anode current needed to sustain conduction is the holding current. The latching current is the value needed to switch the anode circuit on from the off conditions. The latching current is typically about three times more than holding current. lt is the curve between anode to cathode voltage and arıade current of an SCR. 1) Forward Characteristics : When anode is positive with respect to cathode, the curve between V and i is called forward characteristics. In fig. OABC is the forward characteristics of SCR at Gate Current (LG =0). 2) Reverse Characteristics : When anode is negative with respect to cathade the curve between V and I is known as reverse characteristics. The reverse voltage does not come across SCR when it is operated with A.C. supply.